Great post Kaye! It's such a bummer how much other quilters come down on each other! It's so discouraging! If only we could all just get along! I love a good rant!!!! now for the nerves of what will everyone else think. I really like the thought that quilters are artist and just like you might like some artist and not others quilts/fabrics are the same. A 2 year old's scribble is sometime the best art in the whole world so a beginners or simple quilt can be too. Even with that said I still love Monet! Quilters should just let quilters be! Anything homemade with love and then given in love, kept in love, sold in love, whatever, is beautiful. We all don't like the same clothes, shoes, or purses, why do we have to like the same material and patterns? Good for you, I am sure everything you wrote about is something that every quilter thought about at some time. I admire you for saying what is on your mind. I like what you have to say and admire your courage for sharing your thoughts openly! I really appreciated your post. I've been feeling some of these things lately, and I'm glad that I'm not the only one out there. :-) I'm looking forward to hearing about your secret designing projects in the future!! Hmmm. I've never used the term, "not your grandmother's", but I'm pretty sure that some who have used it didn't mean to be mean-spirited, just trying to say that it's not old and/or traditional, it's new and modern, which are all very stereotypical terms which I tend to stay away from. During my approximate year of blogging/quilting (you were one of the first blogs that I started to follow - and I love it!) I can honestly say that there's NO blog that I dislike - I like all the varied creativity, both new and old, modern and traditional, and see so much variety and inspiration it's overwhelming sometimes. Lest I ramble, thanks for being honest and laying it out there! Thanks for sharing so openly, Kaye! I had a lot of the same thoughts and posted about it on my blog, but didn't do it as well as you did. It seems that the facelessness of social media has removed those filters our mom built in to us - you know, if you can't say something nice, don't say anything at all? It always surprises me how unkind some people can be when they don't have to face the person they're talking to or about. That being said, I love your blog, and feel like I know you a little from reading it. I've made lots of great friends over the past year of blogging that I wouldn't trade for the world - and we all love quilting because it makes us happy. That's the best reason to quilt!!! Don't feel bad at all for the long post! Lots of us are getting worked up in so many ways by so much being said. We are all entitled to our opinions. And every blog is a personal space. So, yes, share the rants! You know I do. Good for you for speaking out for yourself and your opinions. I've always appreciated your support on my own little space, happy to share the love back. I agree with every word you have written, especailly with the 'not your granmother's...' comments. She taught me to sew and we have very similar tastes. If she was alive I'd imagine she would be crafting exactly like me. Love this post and so agree with everything you've said. I feel a bit baffled about all the angst going on at the moment - there must be a whole lot of blogs out there I don't even know about because I honestly haven't read anything nasty - only those folk who are throwing their hands up in despair and asking why! However, I agree with you - I get the "it's not your grandma's or it's not your mom's" and I always think "you obviously have never meant my Mom or Grammy." (And we are all comment whores). Well said......thank God for those wonderful grandmothers and mothers who taught us!! Or at least open the idea door! This is quilting people-- quilting! Let's have fun:) Well put Kaye! An open and balanced post I think. Rachel opened up quite a can of worms with her post. I read through the first 200 comments, making notes about what I wanted to add or second, but I left actually commenting till the next day (ran out of time!) and after sleeping on it, I decided not to contribute anything at all. I agree that some of it was getting kind of nasty. I think it is easy to get carried away when you are reading what other people have said already, a bit of a mob mentality. I have been quite oblivious to some stuff you have mentioned and I think it is good to stay that way. I have always considered quilters to be amongst the kindest and most generous of people and I don't want to have that image tarnished. Being too honest can be dangerous! But your post was just right. Oh man! I typed a REALLY long comment to this and it got lost in cyberspace! Ugh!!! If for some reason it does show up, and I am just not seeing it, feel free to delete either this comment or my first one, so you only have one of my long, boring comments on here, hehehehe. I completely agree with you on how grandmothers should be respected, and it's awesome how they've passed on their craft to future generations. But I don't think that the phrase "not your grandma's _____" is necessarily a bad or demeaning thing. I read it as a quick phrase saying that something is a new idea that wasn't explored back in previous generations. For example, when I was little, I would watch my Grandma knit all these lovely things, so gorgeous, and I was mesmerized. But today I see all these other new ideas that I never saw my Grandma knit. So when I hear the phrase "not your Grandma's knitting", I don't see it as saying her work is to be looked down on, or not up-to-par, I just simply see it as meaning that this is a new take on knitting that previous generations never toyed with. But I totally agree with you that the crafts that older generations passed on to us are special, and completely still relevant today. I hear ya! I was so happy to read what you wrote about the "not your grandmother's...." sentiment. While I am sure that people who use that phrase love and respect their grandmothers, there is a dismissive quality to that phrase that has always hurt me (I am not a grandmother, btw!). (I also don't understand how that sentiment can co-exist with the glorification of all things vintage, but that is a side issue.) Truly, we are all following a general fashion in our taste for current fabrics, colours, prints. Our children and grandchildren are likely to shelve our beautiful quilts because they are "so 2010". I also find all the current angst to be reminiscent of the worst parts of high school, and I have steadfastly avoided blogging about it or leaving a comment about it because I want to deny it oxygen in the part of the universe that I can control. However I had to comment here because of your spirited defense of previous generations - you are my quilty hero! I totally agree! I appreciate your rant and thank you for sharing it! I have always felt that way about the "not your grandmother's..." comments but haven't ever said anything. Also to each their own...like you said I may not LOVE everything everybody does but I respect and admire the hardwork and time that they put into it!Also with the so-called "dumbing down" of quilting issue- Not all of us have the local classes that are convienient or even possible for us to go to and those simple patterns are how we teach ourselves and practice. And people should be happy that more people are wanting to quilt and get into the field and be welcoming and encourage their motivation to teach themselves not put them down for not having someone else to teach them. Now that I did a mini rant, lol...I totally love your blog and hearing your perspective and seeing your projects! Thaks for sharing! I've never really thought that much about the phrase 'not your grandmother's...", but I am SO much more likely to keep reading if someone posted, "now this is a quilt my grandmother made..." - I'm much more inspired and likely to take something from a post showing some intricate vintage quilt than yet another modern quilt. I know a lot of bloggers are having confessionals thanks to some recent posts, and it's fascinating reading them all! Nothing wrong with a good rant now and again. Personally, I think this whole quilting thing has been blow way out of proportion. 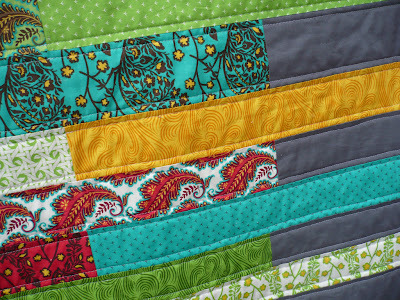 Quilting is quilting. You do what you want to do. If it's modern, great. If it's traditional, great. We're all in it for the pleasure of being creative and having a good time. There shouldn't be any pressure from other quilters to do something that you may not want to do just to "challenge" yourself. I love a scrappy 9-patch block. Whether I use modern fabrics or traditional fabrics that's my choice. And if I make 10 9-patch quilts in a row, so what! Who doesn't love receiving comments?! You're right on Kaye. It does just go to show you, though, that speaking your mind tends to open cans of worms that are hard to herd. I know Rachel didn't foresee all that negativity and I, too, didn't see the dumbing down post explode like it did (I for one, appreciate accurate piecing and don't see anything wrong with trying to sew blocks together well!). I sincerely wish there wasn't this division of two quilting camps that appear to be growing farther apart than closer together. I'm getting tired of doing the splits. Well said, but it doesn't and won't change the world. There are people who have the need to feel superior, no matter what part of life it involves, black/white, irish/english, christian/muslim, straight/gay and on and on and on -- We hope that people can accept equality and encourage others to strive for their best. Well put Kaye! I don't know why we all can't just get along and enjoy the joy we all get out of our craft! Thanks for putting into words what a lot of us have been feeling! I am honored that you found the discussion worth passing along. It seems more difficult than ever (to me) to be real without being rude, but it's something I think is quite valuable to real community. I hope in the end this discussion is somehow valuable to our community. I agree with you, Kaye! If people have negative things to say about a certain blog, why do they visit it? If they don't like a pattern, think it is too basic, they don't have to buy it! I have a confession to make. I will often see a post that I want to comment on, but it already has so many comments I don't bother. I should still show my appreciation. And I also get down about not getting "enough" comments on my own blog -- but Monica at Happy Zombie had a post this week that made me rethink that! I think that was a very good post. I agree about the 'not your granny's...' that kinda rankles me too. I like the traditional styles myself; I'm comfortable with ritual and I LOVE math; but that doesn't keep me from subscribing to modern-quilter blogs.